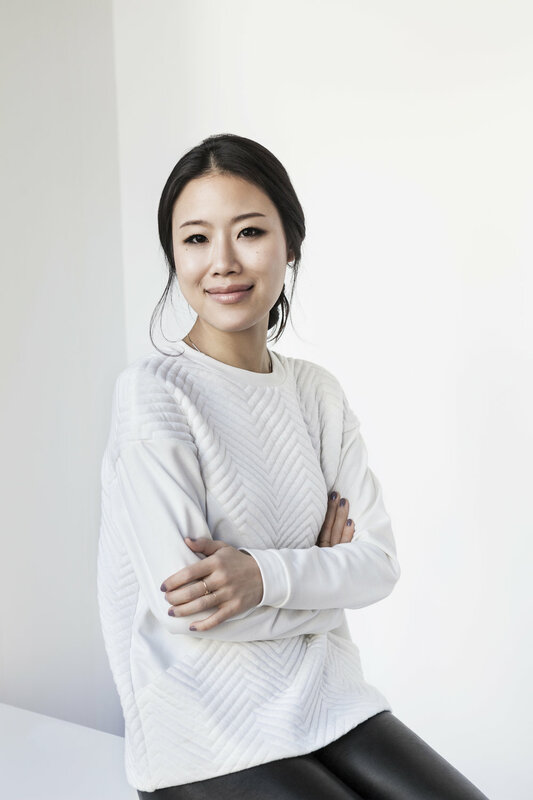 Name: Alicia Yoon, licensed esthetician and founder of Peach & Lily. In the mornings, I actually have been doing a lot less than I normally do because I have been incorporating the seven skin method—a skincare hack that allows skin to be hydrated one layer at a time. 1. I use the Shangpree Cleansing Gel, just a tiny amount, to remove oil produced while sleeping. 2. Then I follow up with Mizon's Snail Cleanser: I love this one for how gentle it is; skin is left feeling bouncy and hydrated. 3. Then I use this Layering Essence Ringer Drip - Lifting by Eco Your Skin, which keeps my skin so so hydrated. This comes with an empty toner bottle and you put this drip into the toner bottle, and then you can layer this onto skin as many times as you want. In fact, in the Eco Your Skin spa, they spray this whole bag onto skin and your skin drinks it right up! I love the chamomile extract and licorice in this. Keeps skin balanced, quenches skin thirst all day and helps keep it plumped up. 4. I seal all this in with a moisturizer. I love the Atopalm Intensive Moisturizing Cream and Peach Slices Citrus Honey Aqua Glow because similar to the Layering Essence, this can be layered once or even five times depending on what skin needs that day, without any pilling and it helps prime for makeup. 5. Then, of course, SPF. And I am hooked onto the Lagom Sun Gel. It's truly invisible and smells subtle. I don't like overpowering scents and this is unnoticeable a few seconds after application and also pleasant when applying." What products or treatments are you curious to try next? "I am fascinated by your own body's ability to heal itself. I'm curious to try Dr. Barbara Sturm's MC1 blood cream, harnessing the power of your own blood, and treatments using your own stem cells. Chaum, a leading health clinic and lab-network in Korea, also creator of Saturday Skin, has some next-level stem cell banking treatments that I'm definitely intrigued by." Best skincare advice? “Getting to the sink to wash my face at night can be such a hurdle sometimes! Once I'm there, the rest of the skincare routine happens easily, but getting to the sink in the first place when I'm on the couch exhausted after a glass of wine is the challenge. The bed is the obvious next step for me—not standing at the sink getting my sleeves wet. I have an emergency nightstand beauty routine stash. There are nights it's really just not going to happen. So I keep Koh Gen Doh cleansing cloths by my bed as I find these super gentle and hydrating while getting everything off; the Femmue Lumiere Vital C since it's silky and smells good and gives skin vitamin C and antioxidants, then I seal it all in with the Peach Slices Citrus Honey Aqua Glow. I can do this easily in bed and I still feel like I treated my skin in a serious way.